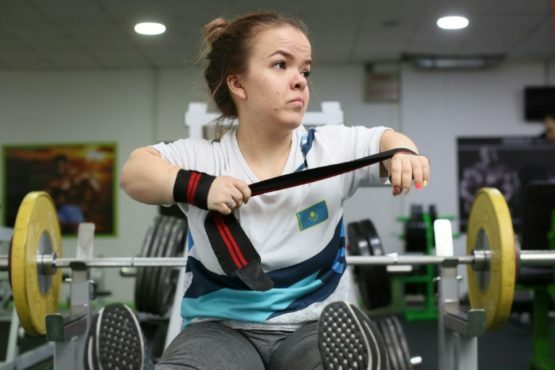 In a gym in Kazakhstan’s largest city Almaty, Paralympic weightlifter Alina Solodukhina’s slight shoulders are feeling the strain under more than 60 kilogrammes of cast iron. Solodukhina, who has dwarfism and is 125 centimetres (4.1 feet) tall, began weightlifting in 2017 and won a bronze medal at the Asian Paralympic Games in Indonesia last year. Her success is symbolic of the ex-Soviet country’s drive to brand itself as a new power in para sports, even though disabled Kazakhs encounter multiple obstacles in everyday life and progress to make society more inclusive is slow. “For the moment, all my focus is on this,” the 25-year-old said of the World Para Powerlifting Championships the country is hosting this summer. A successful showing could help her qualify for the Paralympic Games in Tokyo next year. But Solodukhina would also like the bid to promote para sports to lead to a better life for some of her colleagues in the weightlifting team and other disabled people. “My condition does not stop me doing what I want to do. But for wheelchair users, life is far more difficult,” she said after a training session taking in bench presses, weight machines and a stint on the treadmill. Kazakhstan ratified the UN Convention on the Rights of Persons with Disabilities in 2015 and has claimed improvements in inclusion and access for over 600,000 people registered as disabled, particularly in the last decade. But the overhaul of the Soviet approach to disability that saw handicapped people live in isolation from society has been plodding. “Just getting out of the house is hard enough,” said wheelchair-bound activist Zhaslan Suleimenov. Suleimenov, 42, who is based in the capital Astana, recently renamed Nur-Sultan in honour of the country’s first president Nursultan Nazarbayev, faces multiple barriers to social integration. In 2009, Suleimenov was sentenced to prison on extremism charges that he contested both during and after the eight years he spent behind bars, where he said he experienced torture and mistreatment. Conditions, particularly for disabled prisoners, were “terrible”, he said, a factor that motivated his activism. Conditions for handicapped people in the capital are not much better, said Suleimenov, pointing to inaccessible streets and public transport. Last year, Kazakh authorities proudly unveiled a training centre for disabled athletes just outside the capital but getting there is challenging. “That place is on the other side of the river. Reaching it would be a struggle for me,” said Suleimenov. On a recent afternoon Suleimenov tried to squeeze his wheelchair into a narrow lift outside the office of a local non-profit organisation where he is volunteering while participating in a vocational training programme. After several failed attempts, Suleimenov asked a man nearby to lift him out of the wheelchair and place him on a chair taken from the organisation’s office to make the journey down to the ground floor. Leaving the building, his next challenge was a five-minute manoeuvre over the thick and sticky coating of ice and compressed snow that typically covers the city into the spring months. “We have to hope for the help of passersby,” he said after one loaded him onto a bus home. The oil-rich country of 18 million people has often looked to sport to boost its international image, most recently with a bid to host the 2022 Winter Olympics that was defeated by Beijing. The World Para Powerlifting Championships is another opportunity, which also stresses an attitude towards inclusion. In 2016, Nazarbayev ordered that bonuses for Paralympic medal winners match those of their Olympic counterparts. At $250,000 for a gold, such rewards fees are life-changing and among the highest in the world. But average monthly state support for ordinary disabled people is miniscule, at about $120 per month. This month, Human Rights Watch criticised Kazakhstan in a report on inclusion and rights for disabled people of school age. “Only a small percentage of school-aged children with disabilities in Kazakhstan get a quality, inclusive education in a mainstream school,” the US- based watchdog said. “Children with disabilities living in psychiatric-neurological institutions receive very little or no education at all,” it added in the report. Such challenges are mirrored in higher education, where universities remain “unadapted” for disabled students, and employment, where rates for workers with mental disabilities are “almost nil”, said Veniamin Alayev, chairman of the Commission on the Rights of Persons with Disabilities, an Almaty-based watchdog.